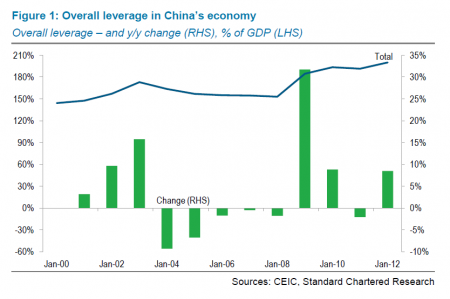 Will richer Chinese want to get freer? 60 minutues interview with Chinese billionaire Zhang Xin. I tend to think economic freedom is a necessary condition for political freedom, but not a sufficient condition. On this, I agree with Milton Friedman. The corollary of above statement is poor countries can’t really have robust democracy. Just look at India. While the rest of the world is going through a deleveraging process, China has been leveraging up. Its economy is getting bubbly. 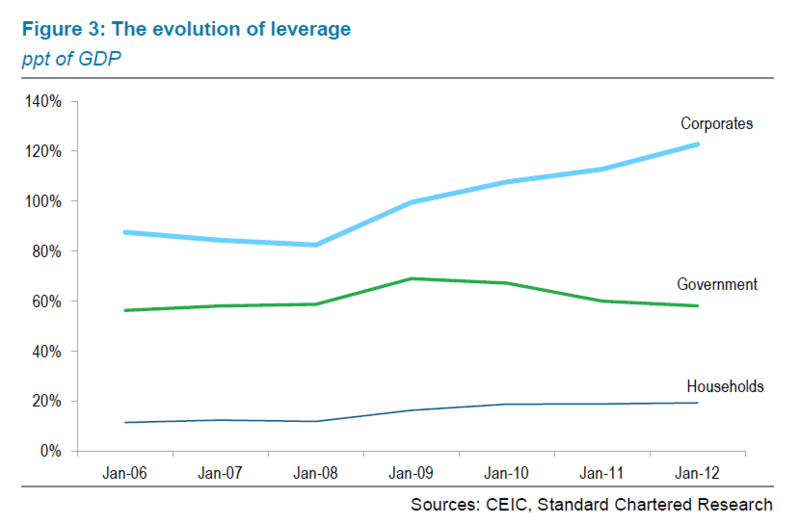 According to research by Standard Chartered Bank, China’s overall leverage ratio (the sum of the leverage of government, corporate and household) now reached 210% of GDP, rising from a rather high level 150% of GDP in early 2000s. Dividing the overall leverage ratio in into three sub-components, we see the biggest increase came from the corporate sector: the ratio in that sector has increased from 80% of GDP at the beginning of the Great Recession to around 130% of GDP today. Most of the leveraged-up corporations are SOEs. They are the natural candidates to respond quickly to government’s call for stimulus spending in the aftermath of the financial crisis during 2007-2009. Besides SOEs, local governments also created all sorts of firms outside of government’s (and bank’s) balance sheet, the so-called local-government-investment-vehicles, or LGIVs. 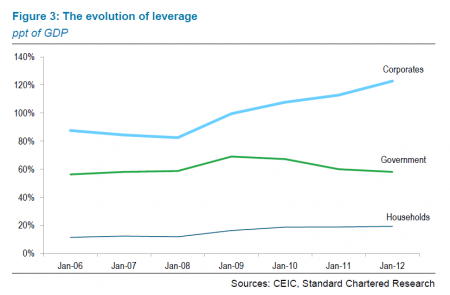 This is Chinese version of shadow banking system. My sense is that they have contributed a great deal to China’s housing bubble. 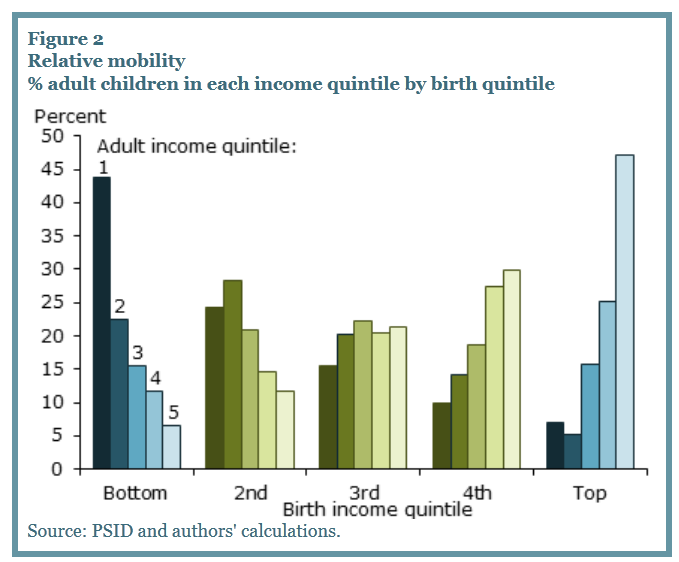 American Dream is all about upward mobility. But it depends on how you define income mobility. 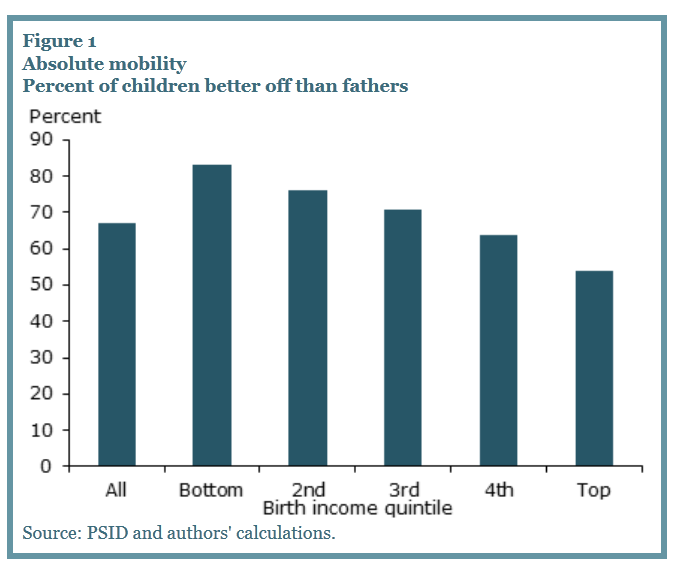 According to the recent research by San Francisco Fed, America is indeed very mobile when mobility is defined by absolute mobility: each generation achieves a higher economic status than the prior generation. 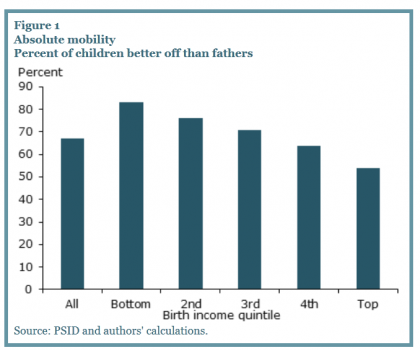 But if mobility is measured by relative mobility, the extent to which individuals can change rank in the income distribution relative to their parents, America is much less mobile. 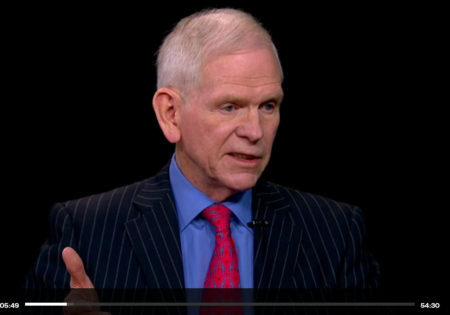 ’60 minutes’ investigates the recent development of Chinese housing bubble in the following video. Following my previous posts (here, here, here, here and here) on China’s housing bubble, I am now re-organizing my thoughts, and starting to work out a formal economic analysis on China’s housing bubble. Specifically, I will address the question if the current housing price in China can be justified by the story of China’s fast economic growth coupled with her fast industrialization and urbanization. My initial analysis clearly says no. I call this a ‘fools-and-greater-fools’ theory. In history, great bubbles always came with even greater stories. China is no exception. 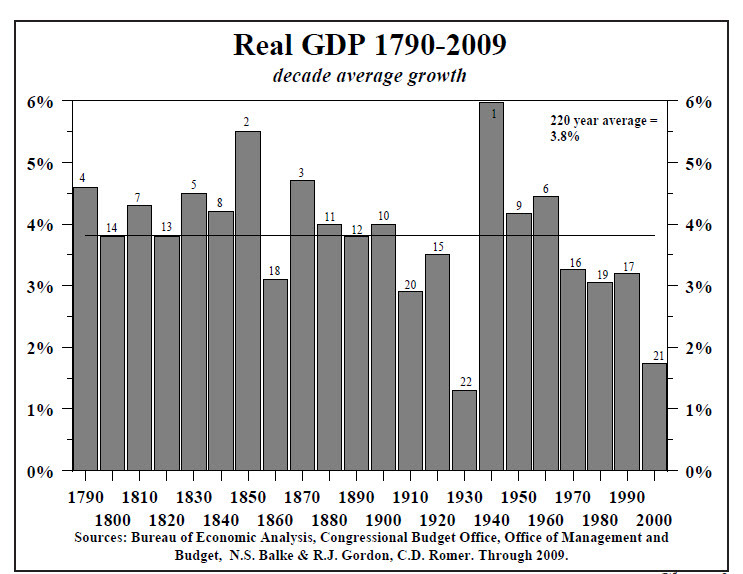 The below graph shows the average growth rate by decade in the US since 1790. 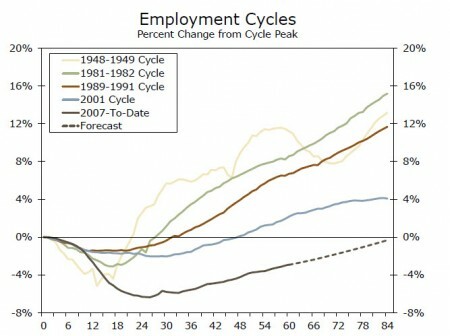 The recent decade, 2000-2009, ranks the bottom 2nd. 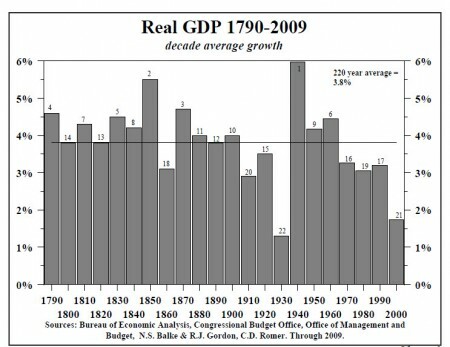 The only worse decade was 1930s. This helps to put a lot of things into perspective. 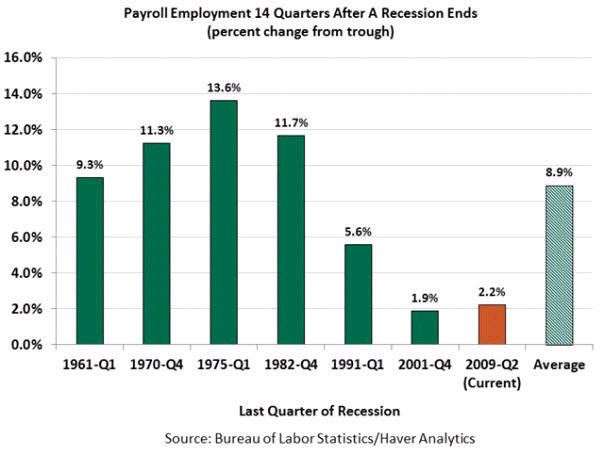 At tepid pace in monthly employment gains, this labor market recovery has been similar to the recovery after 2001 recession, if not much worse. 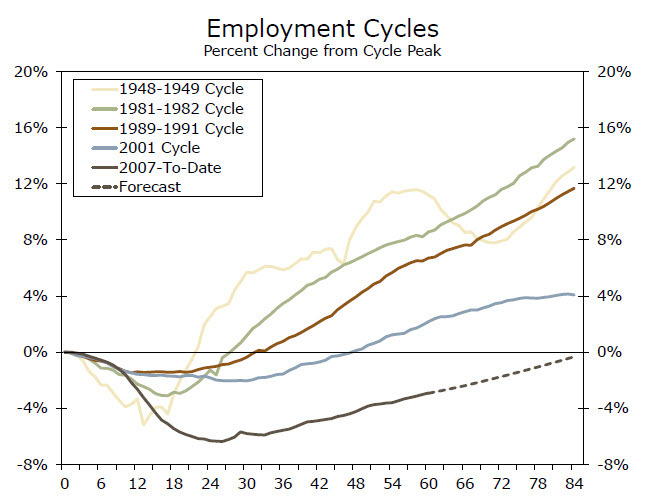 Two charts to put the current labor market condition in comparative perspective – another “jobless recovery”. 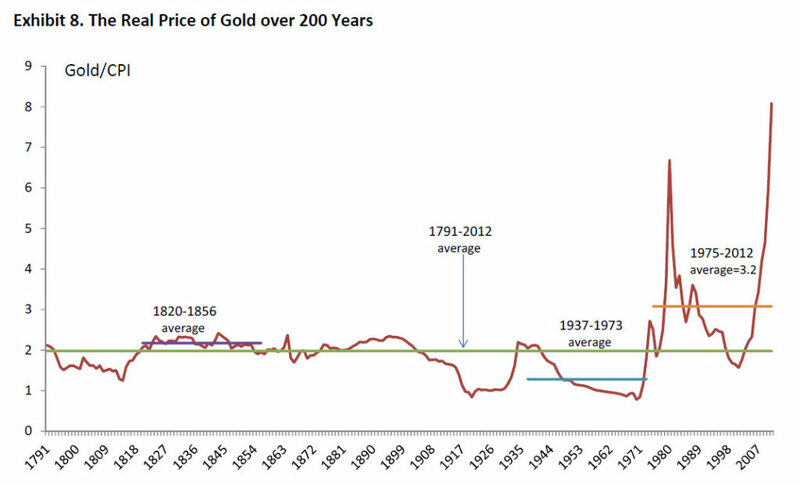 In reading Campbell Harvey’s research on gold, I thought the following 3 charts were most interesting. 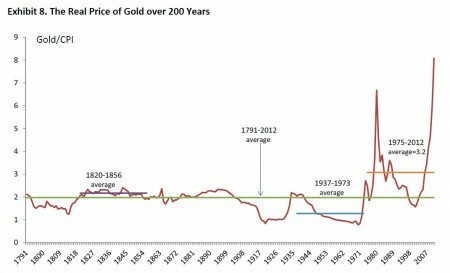 – the current period of price surge of gold has been extraordinary, even dwarfing the gold bubble in late 1970s. 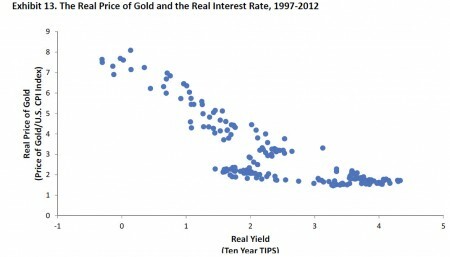 The #1 fact to bear in mind is gold price will eventually tumble in a very big way – it’s fool’s game that you think you can time the market. – in my mind, I always think real interest rate plays a bigger role in determining the price of gold than any other factors, incl. inflation. – jewelry demand responds negatively to gold price: as price increases, fewer people can afford it in countries like India and China, where gold jewelry is popular. 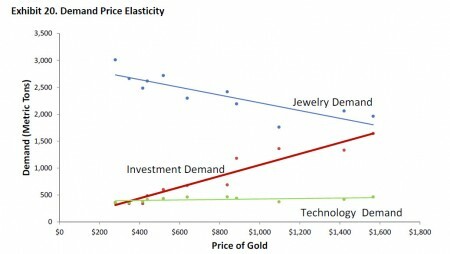 – the waning jewelry demand is more than offset by increasing investment demand, especially in the age of ETFs. – technology demand (or rather supply) responds to gold price very slowly due to the fact innovation in mining gold takes time, but eventually it will catch up. Cheng Li, an expert on factions within Chinese Communist Party, analyzes the new ‘balance’ of power. Unlike the previous generation of leaders, it seems that consensus will be reached more easily, as 6 out 7 of the members of the top decision-making body are from the same faction.